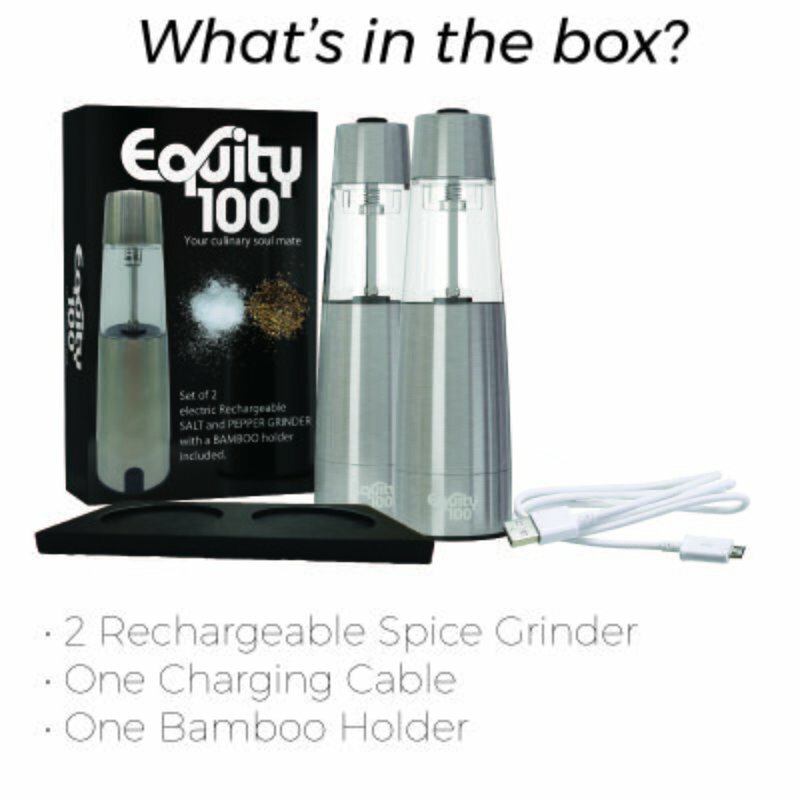 Maximize Flavors, Maximize Pleasure & Minimize Effort With An Equity 100 Electric Salt & Pepper Grinder Set! ... the finest salt and pepper grinder set? ... ways to skyrocket your culinary explorations? ... salt and pepper mills that won’t clog after a while? ... a grinder set that is both rechargeable and electric? Stop searching already! You have just found the greatest rechargeable salt and pepper grinder set. Save your precious time and hard earned money with this beauty. It comes with a Bonus dark bamboo holder. Add Class, Elegance & Style To Your Kitchen With The Sleekest Grinder Set Ever! Have you had enough with small size salt and pepper grinders? Fed up with clogged and jammed electric mills? Worrying about poor flavors and dull tasting foods? Worry no more! With an Equity100 salt and pepper mill set by your side. Eliminate hand fatigue, reduce wrist pain and marinate food in a heartbeat with THE ONLY automatic and buttonless grinder! Combining an excellent stainless steel craftsmanship, impervious moisture penetration body and smart automatic tech, this set is a keeper. Use the freshest herbs and spices, enhance flavors and make your food taste like heaven. Adjust the coarseness mechanism and achieve precise and consistent grinding every single time. Choose a fine grind for salad dressings, purées, eggs, potatoes, pasta, soups, sauces, white meat, and fish. Coarse ground salt and pepper is best suited for marinades, hearty meats, pepper-seared steaks, burgers, stews, filets, and others.